If you subscribe to our Constant Contact email news, you are already aware that we brought back our popular SPECIAL OFFER – DESIGN OF THE MONTH. In March we featured ANATOLIA; in April MOROCCO STRIPE, and in May CELTIC KNOT; in June it was GAME BOARD ; in July and August TULIP & TULIP BORDER. In September, we offered our PISAC pattern and, now for October, SIENA. The current month’s pattern is available at 20% off Retail . 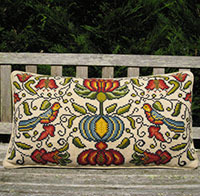 On the cross-point™ online website, you will find a listing of companion pillows that are related in color and pattern. Recently a friend sent me a page from the New York Times (Thursday, September 19, 2013), HOME section, with a short article on a store specializing in antique fabrics that reopened in Manhattan on 68th Street (Antique Textiles Collection). Photos of the showroom and the page banner showed several pillows made of antique fabrics. Pillows “start at $800.00”. My friend attached a note: “some of these pillows look like yours!” Indeed they do! Among the many historic patterns in the cross-point™ collection, my SIENA pattern was inspired by Venetian cut velvets and Jacobean bed hangings in my personal historic textiles collection. It showcases peonies, tulips, pomegranates, birds and leaves in a scrolled fantasy. The 28″ size is perfect for beds, sofas and large upholstered chairs. Here is an opportunity to create your own heirloom at far, far less than $800! Available in my collection are two companions of the same historic period specifically designed for upholstery, Parma (pillow or upholstery) and Newport upholstery (both shown below). Also consider cross-point’s Animal patterns, especially Leopard or Tiger, as well as our 12th Century Geometric. SIENA is available in one size and in 7 colorways (from bright to pastel). Please place orders directly from the web site pattern page for SIENA. This entry was posted in Autumn/Early Winter, Color Schemes - Winter Reds, cross-point Color Schemes, cross-point kits, Historic Textile Patterns, Meadow & Field colors for summer stitching, Part I - Cheerful Autumn Colors for stitching, Winter Reds and tagged About cross-point, Animal Patterns, Autumn Colors, cross stitch kits, cross-point, crosspoint kits, Interior Design, Jacobean pattern SIENA, needlepoint kits, pattern, Sieglinde Anderson Designs, SIENA, upholstery designs. Bookmark the permalink.